Understanding the nutritional information and ingredients in the foods we eat is crucial for maintaining health and wellness, but how much of this information do consumers notice as they shop the grocery store aisles? Tobii Pro Insight worked in collaboration with the American Food and Drug Administration (FDA) on an eye tracking study of shopper behavior and visual attentiveness to nutritional information. 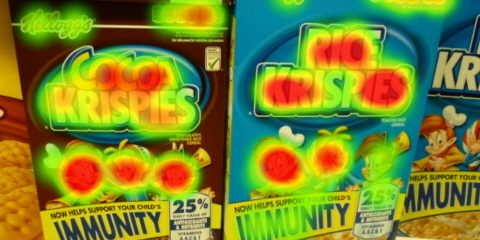 Sixty participants were eye tracked while shopping and then asked to recall important information about grocery products in the cereal, soup, and snack aisles. The results showed that only a third of participants viewed nutrition information at least once, and among those who had viewed the "nutritional contents label," eye tracking data revealed the actual time spent looking at this information was less than one second. Among all participants, only two looked at the ingredients list. These findings suggest there is room for improvement in conveying important point of sale nutritional information to consumers as most visual attention is fixated on non-nutritional elements (e.g. brand name, product name, imagery and pricing). The FDA is responsible for protecting and promoting public health and is one of the United States' governing authorities on food labeling. Given the high rates of obesity and diet-related chronic disease there is an increasing emphasis on ensuring food labeling not only meets regulatory requirements but also promotes informative engagement with consumers which is why studies like this are so valuable.